What will you learn in this eBook? Remote Source Document Verification (rSDV) is a relatively new practice. 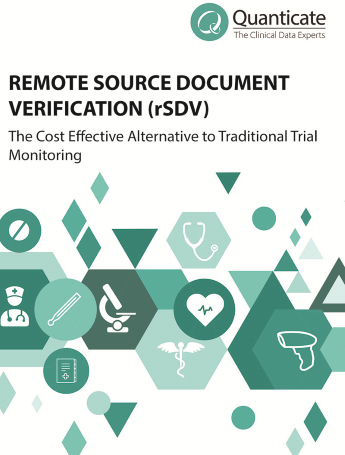 This ebook will explain its definition, present explored and piloted practices of conducting rSDV, discuss the shortcomings of traditional monitoring and 100% SDV, and showcase the cost savings that can be incurred, as well as process efficiencies compared to traditional trial monitoring when using an rSDV approach. You will learn how rSDV offers the best alternatives to ensure the quality of the trial while providing appropriate oversight to safeguard the rights and wellbeing of trial participants. Using mathematical sampling to determine which subjects and data should be reviewed. When SDV is performed on certain data points within the CRF, as opposed to all of them, which is informed by statistical analysis or triggered by certain trial events. An alternative approach utilising technology to improve clinical trial oversight and eliminate much of the expensive onsite monitoring needed for a trial. Complete the form on your right for a free copy of this e-book.